See Ducks (East End Part 1) | Great Auk - or Greatest Auk? Ducks. They’re around. They’re in the park, eating scraps of bread; they’re in barnyards, looking picturesque in the mud; they’re in kid’s books; they’re in ponds on golf courses. They’re homey and familiar. And mostly, they’re dabbling ducks, the sort that point their butts to the sky endearingly and swear incoherently at cartoon mice. But there’s another side to ducks. There are ducks that are wild harbingers of unpopulated climes, ducks that come and go on their own rhythms, uninfluenced by domestication, unmoved by the prospect of stale bread. Sleek ducks that skim over cold waves at the edges of our perception. They are sometimes called sea ducks, and though some of them are found frequently in fresh water it’s a name that fits, because these are ducks that need their space. With more accuracy, they are also called diving ducks, because instead of tipping themselves up on a fulcrum they get their food by plunging wholeheartedly in and taking on fish, mollusks, and crustaceans in their own element. In New York State, the time to go looking for sea ducks is in the winter. Heading south for these birds is no trip to the tropics; they end up in Long Island Sound and other similarly non-balmy climes. So over Valentine’s weekend, the Inimitable Todd and I decided to combine a little romance with a little birding and take a long-weekend trip to the tip of Long Island to look for diving ducks and other cold-water specialties. These Long-tailed Ducks were hanging out right in the marina at Greenport; chilly and quiet in what locals would call the off-season, but a bustling metropolis of human activity compared to the Arctic areas where they breed. True to their nature, they spent a lot of time and covered a lot of distance underwater, and the Inimitable Todd was faced with a considerable challenge running up and down guano-coated piers to try to get a good photo. Meanwhile, I watched from shore, delighted; my only previous experience with Long-tailed Ducks was a pair flying rapidly away during the pelagic trip I took last spring, which allowed for a clear ID but was by no means satisfying. With the trip off to a start like this, could it hope to keep up? Stay tuned! 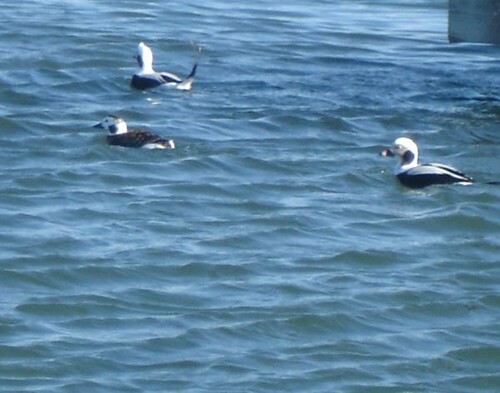 Long-tailed Ducks are among my favorites. but, I just love sea ducks in general. It probably comes from growing up in the midwest where these birds are just a distant dream. Now that I’ve moved to a coastal state where I can find them every year, I’m a happy camper.